With "all" of the recent talk about prime numbers I thought to post this elegant and small summary of the different ways of writing numbers. Above is a lovely detail of a collection of "ancient arithmetical characters", including notations for the numbers 1 through 9 by "Boethius, Plenudes, al Sephadi, Sacro Bosco, Indian, Roger Bacon, and AL Sephadi". It is interesting to see in this found map that the U.S. was still a vastly under-citied place in 1920. This map (from the Statistical Atlas of the United States, compiled by Charles S. Sloane in 1924) created for the census of 1920 shows the locations of cities with populations of 30,000 and above. It is strikingly clear that once you move west of the Minnesota/Iowa/Missouri/Arkansas/Louisiana line, there are very few big cities. 38 in fact-- and half of those in the two states of California and Texas. The rest are distributed fairly widely: six states had no cities >30k, three had one, two had two, and four had three. Other than that, there was a 1000+mile swath of land hundreds of miles wide spreading from central Texas to Oregon in which there were none of these cities. This sweepingly metaphorical title page belongs to Francis Bacon’s (1561-1626) superb Instauratio Magna, printed in 1620. Bacon, the privileged and brilliant son of Nicolas Bacon, the Lord Keeper of the Seal of Elisabeth, entered Cambridge at the age of 12 and never looked back, becoming one of the leading thinkers of the English Renaissance. 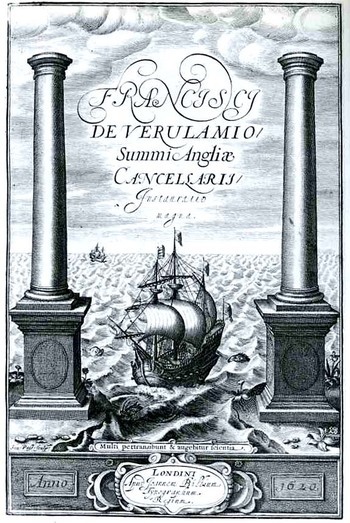 The Instauratio contains his Novum Organum (The New Oganon [New Instrument], or true Directions Concerning the Interpretation of Nature) a monumental pronouncement and a new way of looking at scientific thought, looking to break away from the established Aristotlean methods that had been in place in England and Europe for centuries. The “new instrument” part directly relates to Aristotle’s own work called Organon, which in short was a work of inquiry and a treatise on logic and syllogism—Bacon would present his own new instrument of logic base upon a simpler process of reduction. (Bacon famously begins this work “Those who have taken upon them to lay down the law of nature as a thing already searched out and understood, whether they have spoken in simple assurance or professional affectation, have therein done philosophy and the sciences great injury. For as they have been successful in inducing belief, so they have been effective in quenching and stopping inquiry; and have done more harm by spoiling and putting an end to other men's efforts than good by their own.” He continues in this vein, getting to the real crux of the biscuit, and broadly states in the second paragraph “Now my method, though hard to practice, is easy to explain; and it is this. I propose to establish progressive stages of certainty. The evidence of the sense, helped and guarded by a certain process of correction, I retain. But the mental operation which follows the act of sense I for the most part reject; and instead of it I open and lay out a new and certain path for the mind to proceed in, starting directly from the simple sensuous perception…” And how!) This new approach to knowledge was foremost in the mind of the designer and artist who produced this title page, which is deeply indebted to the analogy between the (very deeply ingrained and mature) age of exploration and that of intellectual discovery. The image is captioned and summarized with the Latin phrase "Multi pertransibunt et augebitur scientia”, wrenched from the triumphantly problematic and slightly insane Book of Daniel (chapter 12, verse 4). It is translated loosely as "many shall run to and fro, and knowledge shall be increased" or more elegantly "many will pass through and knowledge will be increased"—either way, whether by direct adventure and exploration or frenetic activity, the act of a new effort will be rewarded with a new knowledge. 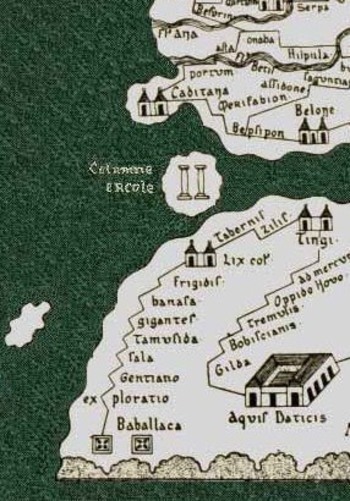 The image below is from the Tabula Peutinger--basically a roman-era road map of the extent of Empire--and shows the location of the pillars. They were mountainous metaphors existing at Gibraltar and Morocco, but folks were only too happy to relieve them in marble. In the efficacies of categories for this blog I wonder about the placement of holes in the history of digging. Most acts of digging results in making a hole, and some digging results in holes that are far longer or wider than they are deep, as in the case of trenches, and especially in the case of trenches dug during WWI, when many thousands of miles of them were dug and filled with millions and millions of men, perhaps as many as a million of them dying right there in the trench. Digging though is not a necessary condition for making a hole, or supporting a trench for that matter. There were many millions of shells fired during WWI, and many of the craters produced by their explosions were converted for use in conjunctions with trenches. There is a lengthy section of the relatively short (104pp) book Notes on the Construction and Equipment of Trenches--published by the Army War College in April 1917-- dedicated to the employment of bomb craters in trench warfare. (This was 2.5 years into a war that Woodrow Wilson and most Americans south to avoid--not only to not fight, but to not necessarily take sides, to stay neutral, and it lasted about 900 very bloody days.) And as it turns out, of course, there are many ways to use a big area of scooped-out/blown-away earth in a complex geometry of narrow and interconnected diggings. The hole could be used as a hole filled with barbed wire as a front line of defense--and here we are told (reminded?) about the scope of the so-called "wiring entanglements", which should be 20 yards out from the lip of a crater which should also be 30' deep (! ), the bowl of the hole lined with 3' high runs of barbed wire that should be irregularly posted . At the rear for anyone who thought of trying to make it through such a hellhole would be a machine or Lewis gun. (The wooden posts should be strong--"light posts are useless".) Great numbers of these craters would be used like star points in a complicated astrological sign of want and destruction, and this book would aid in the education of how to bring these changes about. (Of particular interest is the advisory that entanglement construction should be undertaken in 40/50-yeard chunks, and that the installation of these defensive measures at the very front of a line "should take place at night". Ineed. L'Eclairage, published by la Societe pour le Perfectionnement de l'Eclarage, was printed in 1937, and addressed the use and beauty of proper lighting. The photography is the work of Andre Vigneau, French photographer/film-maker/sculptor (1892-1968), who among many other things was one of the first to design photographic covers for books. This little pamphlet outlines the importance of lighting in photography--aside from that, though, its principal interest for this blog is the absurd/surreal nature of the photographs when taken away from the text and out of context. The image are unexpectedly interesting as cleaved-away photographic documents of unusual perspectives. I was about to post this great image of the attendees of a significant meeting of the American Astronomical Society taken during the meeting in D.C. over New Year's 1924 (Dec 30 1924-January 1, 1925--certainly no one for many years has thought about holding a professional meeting on such a date!1) but I cannot let it pass that the paper on the other side of the photo was one of very high importance. The paper directly opposite the slick reverse of the photo spread is Edwin Hubble's "Cepheids in the Spiral Nebulae"--it was reported in the issue of Popular Astronomy for the 1924 meeting, though Hubble himself wasn't actually there. No matter--he was a meticulous and methodical man, and it seems he was at odd in pressing his results into print too quickly because it contradicted established thinking, which called for caution. (The results of his findings had been earlier presented in the New York Times in November 19242.) But the paper--to paraphrase my brother-in-law Mickey Digh--"was what it was", and (using Shapley's calibration for the period-luminosity relation, published in the Astrophysical Journal in 1918) announced the discovery of Cepheid variable stars in the nebulae M 31 and M 33, placing them at vast distances, well outside our galaxy. This in effect established that the belief of our galaxy being the only galaxy in he universe was incorrect, and that the Great Debate arguing these points on the nature of the nebulae and begun decades earlier was settled. In the next year, 1926, Hubble would contribute a paper on the classification of the nebulae ("Extra-galactic Nebulae", in the Astrophysical Journal, volume 64, pp 321-369) which was highly adaptable and proved to be iconic. Three years later, continuing on the theme of the 1925 paper, Hubble published what has been seen by many as the great astronomical paper of the century, the 1929 Velocity-distance relationship, with Hubble's Constant. So not only were there galaxies existing outside of our own as he had demonstrated in 1925, but that these galaxies were moving, and quickly, away from each other, everywhere. This was the establishment of the expanding universe--the Big Bang stuff (famously put forward in the April 1 Alpher-Bethe-Gamow paper by Alpher, Gamow and Herman but no Bethe, a bit of nerd humor to get ABC out of the initials of the authors of the paper on April Fool's Day, 1939) would come about to explain what the 1929 paper established. Anyway, the 1925 paper is a major step in the history of cosmology, and perhaps the greatest effort in observational cosmology of the 20th century. The other odd thing about this issue is that contains another "first"--not as significant as the Hubble, but still very interesting. It is a short paper by L.J. Comrie--an early visionary and practicioner of the use of the calculator and computer--on the application of the electric calculator to solving problems in astronomy. It looks like this may be the first paper on the use of the electric calculator to solve complex computation problems in astronomical issues. If this isn't the first paper on the subject, it is close to being so--I haven't yet figured that out. This is another entry in a developing thread on marvelous/incredible/Outersider-y book covers and the ideas that go with them. "Butter Tub" units of comparison jumped straight into my brain when I flipped through the pages of Cow Paths to Prosperity (1934), which is basically a very sober appraisal of the cattle industry for the smaller rancher--except of course that it has a fabulous cover and also has a bar graph employing tubs of butter. The Butter Tubs makes perfect sense, of course, but if view just slightly out of context the graph sustains a slightly covert semi-absurdist feel to it. $10 grand doesn't sound like a lot in today's money for having to put up with 4000 modern dinosaurs on an egg farm--but when this pamphlet was printed in Pasadena in 1925, it was a 300+% increase over the average American yearly income. I think the money was a little better and certainly much cleaner for writing about making chicken money than it was to actually do it. of the anatomy of the eye and the mind/brain/eye connection, the work of Rene Descartes usually appears first. It is a general go-to illustration in optics and biology, and it appeared in his Dioptique in 1637. It is standard iconography. For me, an antiquarian non-standard image of the eye appeared today. Hieronymous Bosch is not terribly well known as a person, as a walking and talking citizen of the world--it is known where he died, and where he spent the last twenty years of his life, but the details outside of this are scarce. And even though he signed his adopted name of "Bosch"(he was born ca. 1450 as Jerome van Aken, and died in 1516) very boldly and clearly--and was among the earliest crops of artists to do so in the West--he never dated the paintings. Scholars have determined their dates in some part by the increased realism and skill, which leads me to one of his latest works, the beautiful table top of the Seven Deadly Sins (ca. 1400). Which is clearly an eye--and as a matter of fact the Latin inscription emblazoned underneath Christ reads Cave Cave Deus Videt ( or "Beware, Beware, God Sees"), meaning that the watchful creator sees everything and will be the judge and offer final dispensation depending upon past history. Rendered like this the work reminds me strongly--at least in a symbolist sense--of Ordilon Redon's (1840-1916) Eye Balloon (1878). Well, mostly it is the sense doctored image that drives this recollection more so than the painting--removing almost all of the elements of the Bosch suddenly gave the piece an escapist flavoring, like something in the early modernist movements. The motif of the painting clearly works its way outside-in, with the all-seeing omnipotent being seeing-all, there at the center of the eye, surveying everything that takes place on the living dominion, surrounded at the corners by depictions of Death, Judgment, Heaven, and Hell, and then immediately encompassed by the seven deadly sins. 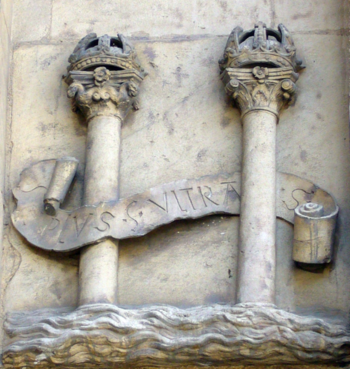 In the floating banner above the main circular image reads "For they are a nation void of counsel, neither is there any understanding in them," and then below "O that they were wise, that they understood this, that they would consider their latter end!" I found it very striking. This magnificent and mega-heavy beast-aeroplane (a "steam aeromotive machine") appears in the pages of Engineering, and is the creation of Joseph M. Kaufmann of Glagow, and makes a splashy show of itself back there in 1868 when not-too-many airplanes were gracing the pages of technical journals. But here it is, a very heavy dream of a Scottish engineer, a massive and underpowered vehicle of questionable design and imponderable consequence. One thing is for sure--it certainly looks pretty. The plan for the aircraft measured 12' from stem to stern (plus another few feet including the tail), with the body about 5'x6', and with wings that spread out 35'--each. The aircraft weighed in at an extraordinary 7,000 pounds and was supposed to be powered by a 40 horsepower steam engine that looked like a locomotive boiler that in theory would keep The Beast afloat at 40 mph for an extraordinary four hours. As surprising as these images look from the modern perspective, perhaps the most unexpected aspect can be seen in the detail under the wing in the drawing on the right (below)--it seems that the motive power was that the wings "flapped", like a bird's. This was asking a lot from those wings. And that engine. There was a lot of "flapping" going on in the experimental thinking for flight at this period, though many of these designs were human-powered ornithopters (like those of Bourcart in 1863, Trouve in 1870, and Wenham from 1858), and which in general didn't last much past the 1870's. There was another class of proposed flying vehicle that adopted bird-wing qualities though the wings didn't flap, like the Le Bris glider of 1868 and the beautiful and graceful patent of the Du Temple monoplane. These designs seemed to last much longer, perhaps most famously in the designs of Otto Lillienthal's gliders of the 1890's and the Vuia machine of 1906. What the Kaufmann aircraft had that these others didn't was its guiding principle of stability, a 40-foot cable with an 85-pound weight on the end of it--a "pendule" of motion and stability. Mr. Kaufmann built a 42-pound model of the aircraft--things did not go well in the experimental firing, with the boiler failing right away, but not before the wings fell off. Here's an interesting, short timeline that I found and and which I reprint below--it was part of the appendix to the book by J.-P. Luminet, L'Invention du Big Bang (Editions du Seuil, Paris), which was printed in 1997. "Ce texte est l'introduction de l'ouvrage A. Friedmann, G. Lemaître : Essais de Cosmologie , traduction et notes de J.-P. Luminet et A. Grib, Le Seuil, collections 'Sources du Savoir' ". This is perhaps one of the most beautiful engravings found in the military textbook by Johann Choura, Lehrbuch der Geometralzeichnens fuer id K.K. Militar-Realschulen, which is a work printed in Vienna in 1879. Its actually from the second volume, which is Darstellende Geometrie, a course on applied geometry for the engineering student in a military-minded advanced school. It is not-so-simple and a lovely work of techArt. The progress of man/humankind has, in our dim antiquarian past, been represented in art in stages of ascending a mountain. The fine arts and sciences have been shown, in their various intellectual pedigrees, at various points on the mountain of the mind, usually with Philosophia sitting supremely at the top (with Astronomia and Mathematica generally not far underneath). This is mind, I came across another sort of progression to the Olympian heights, though it has no people in it, just the mountain, and a curious idea, ascending to faith, or truth. Stumbling into things like this makes you remember that the Renaissance wasn’t all stuffy and main-springy; perspective-this and techno-that; they had their fun, too, even in 1545, and put it into print. Back to the woodcut on the title page: it features a small, winding route up a mountain, the top of which is sanctified “fide”. Now considering what these folks were doing in this work I wouldn’t necessarily christen the end of the adventure with this word, particularly if it meant (as it does) the name of the World Chess Federation (FIDE). Seriously though fide means “faith”, as in bona fide (on good faith, by good authority), as opposed to mal fide (bad faith). I cannot determine what in the world the structure is on the top of the mountain, or what is in it. This was a surprise, finding M. Bollee's article (Sur une nouvelle machine a calculer) in this 1889 Comptes Rendus, pecking around in that big 10-pound volume looking for something else. It was very easy to miss if you weren't looking for it, just a few pages long in a 1000-page book. But there it was, nestled comfortably in pp 737-739. It these few pages Bollee describes his machine and with particular reference to his innovative approach to direct multipilication--a fine addition (ha!) to the long line of contributions by Babbage and Clement, Scheutz, Wiberg and Grant and Hamann. Léon Bollée: "Sur une nouvelle machine a calculer", in Comptes Rendus de l'Academie Sciences (Paris), volume 109, 1889, pp. 737-9. This beautiful, home-made pamphlet was pieced together in 1847 or thereabouts, bits of an article on Attica by Professor A.L. Koeppen, cut from the North American and U.S. Gazetteer, and then pasted onto and covering the pages and cover of a chapbook. Everything about this little (5"-tall) book is stiff--the flexible paper wrappers of the pamphlet and its pages had been soaked with glue to such a degree that they're all like boards, but with the feel and sound of paper. All in all the feel of the book is very satisfying, and very comforting, somehow. When God Splits the Atom (1956) offers a not-so-friendly piece of advice: "its later than you think". We are told that God delivered the atom and the atomic bomb and the end of the war and the beginning of the United Nations. None of that will save us from the burning ring of fire, and the U.N. will fail, and so on, down to the firey pit if there is no repentence and acceptance of the higher power. The cover pretty much tells the entire story. The idea and imagery of the atomic bomb was instantly re-purposed and used to identify and sell food and comfort, and was employed for hotel names, cakes, dart games, watches, restaurants, patience games, and so on--God was just one of a series in a long line of a-bomb apps.